reduced price. The aKademy press team arranged a meeting with Thomas Schneller, Manager Software R&D and asked him about this venture from HP. My name is Thomas Schneller, Manager Software R&D of the HP EMEA Product Development Center based in Munich. I was part of the Linux Core team which developed the first Linux pre-installation on a nx5000 Laptop. were the strong points for offering a KDE desktop to your customers? We used the standard configuration which comes with SUSE Linux which is KDE. We believe that KDE is a good choice as it offers basically everything needed on a today's desktop. Do you give support for the nx5000 configured with a KDE/Linux configuration? that laptop which is similar to Windows where we offer the same support. Are there any plans for more models supporting Linux? for Linux in the first place. Right now the nx5000 is not available in Europe. Do you have any plans to sell them anywhere other than the US? Just choose Linux as OS and the Integrated HP W500 wireless option. time we released the pre-installation. Will you support people who build device drivers and will you be giving them hardware information? Yes, we already work with the open source community. As an example have a look at HP & Open Source where several Open Source projects are hosted. Does power management and the winmodem work on the nx5000 as they do under Microsoft Windows? as we are eager to hear people's experiences with our product. Did you have some problems of getting hardware components to work? We carefully choose the target platform for that project. We wanted to make sure everything just works. The only problems we had during development were caused by pieces of hardware where detailed specs were not available to us. Will this only work on SUSE or do you have any plans to support more distributions. Does HP have any plans to better support Linux in general? ROMPaq for HP Notebook System BIOS (68BCU ROM) Linux-Based. a bootable diskette or a bootable CD. Then you only need to reboot with the bootable media and can flash your BIOS easily. Plans to collect and offer Linux pre-installation instructions and white papers on an open source basis are discussed as well. Did you write any additional software for the nx5000 project? Any plans maybe on doing that? for example the power management applet. So we did not need to write additional software. your project has an interesting piece of software please let us know. Can you tell us about any experiences your customers have with the KDE desktop on these laptops? we are on the right way. to our developers. What's the gain for HP for doing all of this? please don't hesitate to send us any problem you're having with the nx5000 you bought. Yes. Please post your comments below the article. I will read through them and answer any question appearing. Thank you for answering these questions and also a big thank you for the support HP has given to KDE. I see that there is a screenshot of Finding Nemo on DVD. Does that mean that LinDVD (the stated player) is packaged as a working DVD player? By default SUSE has disabled DVD playback on xine and MPlayer for legal reasons (on easy download of MPlayer "fixes" this). Is legal playback of DVDs available 'out of the box' for these laptops? 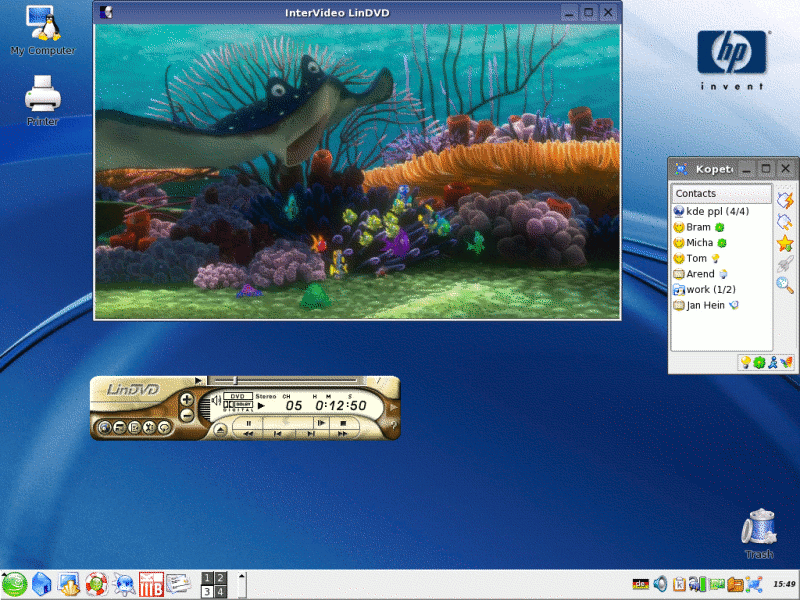 FWIW, at least the Notebook that I got at aKademy has LinDVD installed. And how does it compare to Ogle/Xine/Mplayer? Does it feel like a native linux application or more like a wine-based quick-and-dirty port? Even encrypted DVDs? How? I play everything like DivX no problem even when Windows folks have to go around chasing the latest codec, it still seems to work on MPlayer. But DVDs, how? It doesn't usually work for encrypted ones. I'm not sure about the HP, but with Linspire you can purchase a DVD player for $4.95 if you're a Click-N-Run member. Basically it is Xine with a licensed decryption module. It worked flawlessly for me, and for $4.95 and a quick download, it was a bargain. Even WinXP doesn't play encrypted DVDs out of the box. Just install DeCCS and it works. At least, I have not yet seen a DVD that does not work in my machine. I usually use the MPlayer backend for KMPlayer, and MPlayer is compiled with libmpdvdkit for DVD support. >Is legal playback of DVDs available 'out of the box' for these laptops? Yes. LinDVD ist part of the pre-install. I'm assuming LinDVD is a commercial product, and is licensed to read CSS encrypted DVDs. Suse's desktop Linux must include this by default. You won't see anything like that in the downloadable Mandrake or Fedora, since it relies on non-OSS software. That's a bit odd, don't you think? "When you're a monopoly you can dictate your licensing terms however you like..."
Actually anyone can dicate licensing terms. "Take it or leave it" contract terms are very routine. When you have a product all the OEMs want and the all the OEMs are on extremely thin margins, then you're very likely to get them to agree to your terms. If you don't have a monopoly, your prospects can just go to the other provider. If you have a monopoly, the can't and therefore they oblige. > That's a bit odd, don't you think? Not really. It's part of Microsoft's OEM program. If you're HP, it actually makes the Windows Tax more bearable. Not odd at all. Who needs enemies with support like that ? You are mentioning that the localization work for Europe was too much for HP. Did you consider selling the nx500 with a blank hard disk to local partners like Mandrake Linux in France and leave to them the work of installing their tailored Linux Distribution and then distribute it through their online store and maybe HP online store ? All in all, it is a great move. The Gnu/Linux/KDE market is still quite small and fragmented but I believe that if HP offers the possibility to sell be OS agnostic desktop systems, it can help it regain some market and differentiate itself from Dell. In French Research institutions and Universities, Dell has lately won most of the procurement contracts. But these institutions are slowly moving to Linux and HP move could certainly help the company regain some market share. I second that. Mandrake is the way to go. RedHat/Fedora is too focused on Gnome, which in my opinion falls short on the desktop. SUSE have choosen KDE, but are too focused on enterprise, which is hurting their desktop profile. Mandrake on the other hand has always had a strong desktop profile, and has been the best choice for desktop Linux for years. And Mandrake has a sad history of breaking KMail by backporting unfinished features from the development version to the stable version (on-the-fly spellchecking was backported and we received crash reports, the anti-spam wizard was backported and we received crash reports). And then Mandrake thought it would be a cool idea to use ~/.Mail instead of ~/Mail for storing the mail. Well, there's nothing wrong with that if it's done right. But guess what, we have received multiple bug reports about this because apparently Mandrake didn't manage to do it right. The result of this is that I don't trust any bug reports coming from Mandrake users until they have been confirmed by non-Mandrake users. I'm sorry about that, but I really don't have the time to investigate whether such a bug is Mandrake-only or not. I can't remember any other distribution causing us, the KMail developers, comparably much pain. On the other hand, they put a lot of effort into integrating Kolab. I believe Mandrake mistakes are past. >I can't remember any other distribution causing us, the KMail developers, >comparably much pain. In fact all I see as a result of that is better and simpler support for some tasks in suse. That includes instalation of Software (nvidias drivers for instance, check the specific SUSE instructions on their site), profile management, etc. What exactly were you thinking about? How do you think it hurting their desktop profile? Could you give examples? >Did you consider selling the nx5000 with a blank hard disk to local partners like Mandrake Linux in France and leave to them the work of installing their tailored Linux Distribution and then distribute it through their online store and maybe HP online store? Distributors are invited to contact us any time if they want to develop an own pre-installation. For cooperate customers we have a version available with freedos pre-installed. For legal reasons we can not ship units without OS. So this is our solution to address this kind of requests. In practice, where to get such offer? Why not? A lot of white-box manufacturers sell systems without OS. Does HP have a different regime, or are those manufacturers doing something illegal? I am not familiar with the details. Usualy developers don't deal with this kind of stuff. But other manufacturers might not have this requirement. Small seller (for example single shops or small groups of shops) do not have any license contract and they (and their clients) pay the full price of a license. But that allows them to sell the computer without any OS or directly with a Linux. To be more precise: as the contracts are secret, it is well possible that one manufacturer having a contract can do it and the other one cannot. I have the nx9010 dual-boot notebook (WinXP and RedHat FC1). Linux can be run with FC1 native kernel and a custom built with hibernation (sw suspend) and NTFS driver. Can I benefit from your work and install SUSE instead of FC1 to get full hardware support? (will WinXP run with flashed BIOS?) If so could you give some advices? >Can I benefit from your work and install SUSE instead of FC1 to get full hardware support? During development we addressed several general issues together with Suse appearing when installing Linux on a Laptop. Specially ACPI aspects. So others might benefit from that if they are installing Suse on their Laptops. But I can not say, if all hardware will be supported out of the box as we focused on the nx5000 specific components. Question: what's not supported so far on the nx9010? >will WinXP run with flashed BIOS? Yes. The approache here is to offer a BIOS which can be flashed on a Linux machine directly. But it's not a special BIOS version. And right now it's only available for the nx5000. We discuss to offer that for other models as well. Even the hibernate worked for me but my filesystem used to get corrupted from time to time then I decided not to use hibernate. The only one thing that bothers me now is that the two USB 1.1 controllers, ethernet card, video card and modem use the same IRQ 10. Because of this from time to time I see a "too much work for IRQ 10" message in /var/log/messages. Who could I contact to help me with this problem? It would be great if the BIOS let us change the IRQ assigment, but it doesn't. there is a way to modify how the kernel assigns IRQ resources. And as every time, a solution to configure it within Linux. Good luck! As a tester of the nx5000 pre-load I tested this function many times. The distro tested was Suse 9.1. I experienced some problems in the beginning. Suse writes the content of the RAM into the swap partition. So if it happens to be a state, where the RAM content can not be restored for any reason you will lose your swap partition. Slowing up performance. Cleaning swap solves the problem. My personal opinion is, there is still more work to do. The current target should be a clear definition within the community how to standardise the implementation of this kind of functions. What's about wake up? Seen many drivers failing here. First thing to fix. So go forward. Any feedback is welcome. Thanks for poiting me to the HOWTO. I'll try it. When the notebook wakes up everything works fine, even X11, sound card and modem. I haven't tested the ethernet card and the X11 DRI driver after hibernate. I haven't had any crash after waking up. Hibernate was working amazingly for me, if it wasn't for the fact that my Gentoo Linux run fsck once in 21 mount operations I didn't even know that the partition had got corrupted until it was too late. Fortunately I lost only a few KDE config files in my HOME. When I tested hibernate I used kernel 2.4.22, now I use 2.6.7. I'm planning to use hibernate again with 2.6.8.1 or 2.6.9. > Question: what's not supported so far on the nx9010? You mention European users can order the laptop from the U.S. Unfortunately I can't see an option to customize the keyboard layout. Is there any way to get this notebook with a Spanish or French keyboard, for instance? (They have some additional keys, such as "ñ" pr "ç"). My HP Compaq nc4000 notebook came from Sweden... I have solved keyboard layout problem with usual keyboard stickers that have cyrillic letters on them. That's quite cheap decision in our country. :)) Ah, and SuSe 9.0 works quite OK on this machine. The only *real* problem is Suspend mode. Standby mode is working, however. >Is there any way to get this notebook with a Spanish or French keyboard, for instance? - using a distro like SUSE is good, as many commercial software packages are basically only supported on RedHat or SUSE. - any plans for more HP branding on the desktop? From what I can see, they look like a standard SUSE desktop. Any plans for customizing the themes, icons, etc, to make the desktop more HP-like, like Sun has done? >- any plans for more HP branding on the desktop? As mentioned in the articel it depends on the market reaction. > Any plans for customizing the themes, icons, etc, to make the desktop more HP-like, like Sun has done? We didn't discuss that. The wallpaper was the only thing we customised do far. nx-series. I've Debian on my nx7000 and always need to borrow a harddrive of a friend (which has windows on his nx7000) to flash the BIOS. If HP would make a BIOS Flash utility available for Linux, this would be great! The Winbond driver *specifically* states that it is not for the ENE Technology device. Thomas: could HP exert some pressure on ENE to release specifications to the open source community? Ad-hoc efforts from BSD and Linux people have not had ANY success. Seems like it'd be a very noble thing for HP to do. Please advise. Another thing: on a ZD7000, one cannot change out the broadcom minipci card for, say, an atheros card. For those of us who do wireless hacking this is a very big lose. Could a revamped BIOS happen? Finally, ACPI suspend is very problematic with the ZD7000. Nvidia and other drivers are a problem. Could HP post specific guidance on making it work? If HP got its Linux act together, I would buy another laptop from HP. However, I can't say I would at this point: there are other manufacturers who seem to be more willing to provide better support across their product lines. I think you can't get your warranty in the EMEA if you purchased the hardware in another world-region. I have one problem two months ago with a Compaq Presario purchased in Italy, HP refused to honor the warranty for the display panel in LATAM. Luckily I could carry the machine to Italy one month later.